In 1936, in England, the KC changed their standard to include cream in acceptable colors. Today, English Golden Retrievers can be found around the world. However, to be a full English Golden Retriever, the dog must have European lines from both parents' sides that meet the standard for the KC. The English Golden Retriever will reach a height between 20-24 inches. Their heads are generally larger and blockier than that of their American counter-parts. The thick, soft and water repellent coat can come in a variety of shades. Any shade of gold or cream is acceptable. English Golden Retrievers are very loyal to their families. They are great with kids and other household pets. They are also very obedient and intelligent	English Golden Retrievers are very loyal to their families. They are great with kids and other household pets. 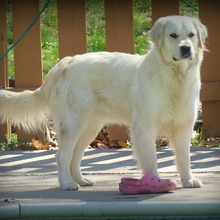 They are also very obedient and intelligent English Golden Retrievers are sweet, loving and athletic. They are a laid back breed but yet still playful. You can find English Golden Retrievers puppies priced from $300 USD to $12000 USD with one of our credible breeders. Browse through our breeder's listings and find your perfect puppy at the perfect price. English Golden Retrievers are sweet, loving and athletic. They are a laid back breed but yet still playful. English Golden Retrievers need groomed at least 2 times per week. They should be kept on high quality food and vitamins as well. Exercise is vital in the health of your English Golden Retriever. English Golden Retrievers are an intelligent breed that need consistent training. They are obedient in nature and are easily trained. English Golden Retrievers need plenty of daily exercise, especially if they are kept indoors. English Golden Retrievers Puppies for Sale - Shipped Worldwide! Finding the right English Golden Retrievers puppy can be dog gone hard work. PuppyFind® provides a convenient and efficient means of selecting and purchasing the perfect English Golden Retrievers puppy (or English Golden Retrievers puppies) from the comfort of your home, 24 hours a day, 7 days a week. Take advantage of our PuppySearch or leisurely browse our directory of hundreds of dog breeds, English Golden Retrievers dog breeders, English Golden Retrievers dogs for adoption, and English Golden Retrievers puppy for sale listings with photos and detailed descriptions. Some English Golden Retrievers puppies for sale may be shipped Worldwide and include crate and veterinarian checkup. Many English Golden Retrievers dog breeders with puppies for sale also offer a health guarantee. With thousands of English Golden Retrievers puppies for sale and hundreds of English Golden Retrievers dog breeders, you're sure to find the perfect English Golden Retrievers puppy.